Last month the government announced that nearly 434,000 square kilometres of land and ocean floor in New Zealand’s exclusive economic zone would be opened up for oil and gas exploration. The areas in include onshore areas in Taranaki, the East Coast and West Coast, and five offshore areas – Northland, Taranaki, the Pegasus-East Coast Basin, the Great South-Canterbury Basin, and the New Caledonia Basin northwest of New Zealand. This is in addition to many other areas already being explored. “While exploration won’t necessarily be undertaken in all the blocks on offer, it’s important to find out what’s there and use the information to develop New Zealand’s untapped resource wealth,” said Energy and Resources Minister Simon Bridges, launching the 2014 block offer process, an annual permitting round allocating petroleum exploration permits. 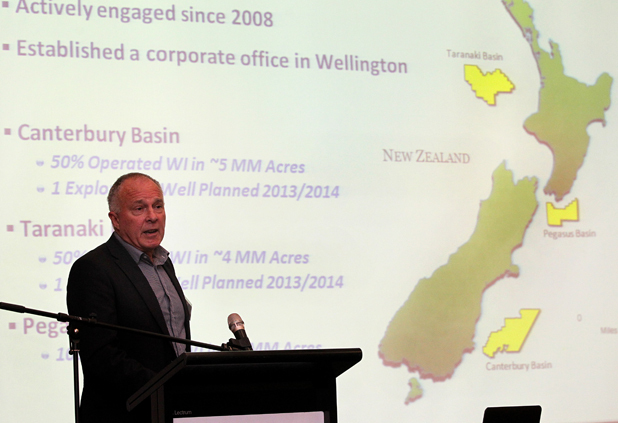 The government is consulting with Iwi and local authorities but the ability of the general population to have an input on drilling permits has been restricted. Under an upcoming law change[i], drilling permits will be handled by the new Environmental Protection Agency, but are be “non-notified”, meaning members of the public would not get to have a say. This change was introduced to the Marine Legislation Bill by way of a Supplementary Order Paper; meaning like so many controversial bills passed by this government it was not subject to a parliamentary select committee, where the public could make submissions. This follows the legislation dubbed the ‘Anadarko Amendment’ by environmental groups, named after the Texas based oil company that plans to start drilling in New Zealand waters sometime in the next five years. The amendment criminalises protesting at sea, which arguably played a role in Brazilian firm Petrobras abandoning plans to drill in New Zealand waters back in 2010. Submissions on the Marine Legislation Bill, prior to the addition of supplementary order paper, were not without concern either. The Environment and Conservation Organisations of NZ, an alliance comprising fifty-five environmental groups, believes the legislation doesn’t go far enough in implementing international agreements around pollution. New Zealand has not ratified the International Convention on Civil Liability for Bunker Oil Pollution Damage, which was adopted to ensure that adequate, prompt, and effective compensation is available to persons who suffer damage caused by spills of oil. Or the International Convention Relating to Intervention on the High Seas in Cases of Oil Pollution Casualties which affirms the right of states to “take such measures on the high seas as may be necessary to prevent, mitigate or eliminate grave and imminent danger to their coastline or related interests from pollution or threat of pollution of the sea by oil”. While local laws and other conventions that New Zealand has signed contain measures for environmental protection, this information certainly raises questions about the risks of deep sea oil drilling. Some of the possible drilling areas are deeper than the location of the site of the 2010 BP spill in the Gulf of Mexico, which saw the equivalent of 4.9 million barrels of oil polluting the ocean. Technology to cap an oil well has improved since 2010, but Radio New Zealand reported back in June that the equipment needed to cap an oil rig in New Zealand waters in the event of a spill would have to be shipped from the UK, taking approximately two weeks. Frank Macskasy writing on the Daily Blog calculated that would be enough time for 788,500 barrels of oil to spill into the ocean. To put that number in perspective, imagine sixty-five Olympic sized swimming pools filled with crude oil. Oil is New Zealand’s fourth largest export (after dairy, meat and wool). Currently oil production last year was the lowest since 2008, though the general trend is toward increased production. “If you look at the figures over the last decade there’s been exponential growth” Simon Bridges told The New Zealand Herald last month. Offshore drilling has become an increasingly attractive source of oil as onshore wells start to run low and the price reaches the point where the extra expenditure required can be justified. Declining conventional oil production means the world is seeing increasing exploration of deep sea reserves, as well as practices such as hydraulic fracturing, an incredibly resource intense method of extracting oil from rocks. ‘Peak oil’ is a term that has entered the public consciousness in the last decade, though it is often misunderstood as meaning the point at which the world’s oil reserves run out. What it actually refers to is point where oil production peaks, and begins to decline. Eventually, market forces would mean oil use is eclipsed by other forms of energy. Of course, free markets don’t really exist outside of economics text books. Global public subsidies for fossil fuels were $523 billion in 2011 (compared to $88 billion for renewable energy). According to the World Wildlife Fund the New Zealand government is subsidising the oil and gas industry to the tune of $46 million per year (subsidies have doubled since National came to power). Even if subsidies were to end, the market does not move fast enough for the climate. Earlier this year the concentration of carbon dioxide in the atmosphere reached 400 parts per million, making at least a two degree increase in average global temperature a likelihood by end of the century. Last summer New Zealand had its worst drought in seventy years, followed by the warmest winter since record keeping began in 1909. Climate change happens much slower than an oil spill, but will ultimately be more destructive. In the long term, the much touted economic gains from opening up New Zealand waters for oil drilling will pale in comparison to the costs of adapting to a warmer climate. But free market capitalism has never been a suitable system for long term economic planning. In the absence of a transition to a planned economy, capitalism, which has shown itself to be incredibly resilient, will likely survive climate change, but the world’s poor –those least responsible for it- will disproportionately suffer the consequences. A transition needs to be made to a carbon neutral economy; the process that takes is a discussion beyond the scope of this article, but immediate goals would be the end of fossil fuel subsidies, and the divestment of funds supporting fossil fuels. The latter is a key campaign plank of 350 Aotearoa who are “calling on the NZ Super Fund, our KiwiSaver providers, banks, churches, the Government and more to divest our money from the fossil fuel industry”. The campaign has already had some success with church organisations. The Super Fund has over $440 million invested in fossil fuels. 350 Aotearoa asserts that “democracy in New Zealand is under threat,” and the sight of activists being arrested in the Taranaki basin would seem to demonstrate this. However for hapu such as te Whanau a Apanui, whose direct relationship to the land and water is undermined by oil-drilling, capitalism has never been democratic. We must struggle not only against environmental destruction, but for community ownership and planning. [i] As we go to press the bill has not yet passed into law, although it is expected to.